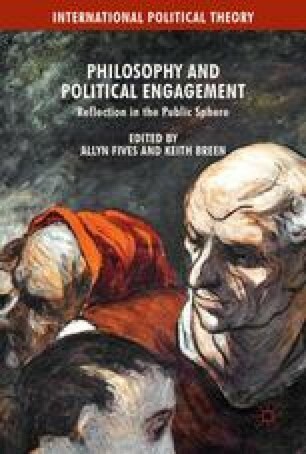 Fives offers a critical examination of the role of philosophy in the public sphere, focusing on the work of Stuart Hampshire, John Rawls, Bernard Williams, and Jonathan Wolff. Not only have philosophers promoted a particular type of society or a particular resolution to one of society’s problems, some philosophers have left the campus behind, entered the public arena, and tried to sway and influence people and events, whether as public commentators or as members of committees. Fives argues that, because of the diversity of philosophical doctrines, there is no one distinctively philosophical approach to public matters. In addition, because of the diversity of moral considerations appropriate to public matters, it is possible for these to come into conflict in any one instance, thus leading to moral dilemmas. I would like to acknowledge the insightful comments made on an earlier draft of this chapter by Joseph Mahon and Keith Breen. I have also benefitted from discussing some of the issues raised in this chapter with David Archard, Mark Haugaard, Richard Hull, and Jonathan Wolff. Chomsky, N. (1967). The responsibility of intellectuals. The New York Review of Books, 23 February. Retrieved July 20 2015, from http://www.nybooks.com/articles/archives/1967/feb/23/a-special-supplement-the-responsibility-of-intelle/.